I grew up in a small factory and furniture town in North Carolina called High Point. It is a simple place were people work hard (when work is to be had), spend a lot of time with family, eat like you would not believe, and generally take it easy. This is important because High Point is the lens through which most of my experiences are filtered. Subsequently I have lived in much bigger cities in the USA, and the mother of all cities that was Busan, South Korea, population 4 million. So when I come across a quaint small town like Siem Reap, Cambodia, there is something in me that triggers a bit of nostalgia for "home." That being said, Siem Reap is nothing like High Point, NC in any meaningful way other than that it is a small town. Siem Reap is the base camp for all things Angkor Archaeological Site, with Angkor Wat being the most famous. I will get to that in a second. But first, have a look at the little alley in the Old Quarter that runs parallel to Pub Street. 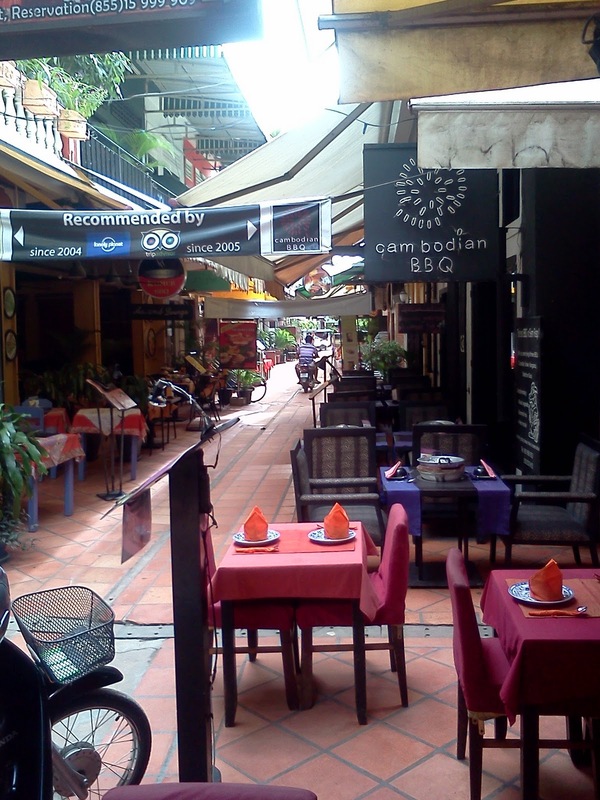 This gem of an alley is lined with restaurants of various types from traditional Khmer cuisine, French bistros, Western cooking, Thai food, and an assortment of other tasty treats. One of my favorite Cambodian/Kymer dishes is Amok. Amok is steamed curried fish that is coated in a thick coconut milk with various spices and then baked or steamed. The best part is that it is usually placed in a bowl made from banana leaves before it is steamed. I could write an entire post about the food and the old quarter, but I am being lazy and have so much to do, so just know that your stomach will be more than satisfied for about $3 USD. 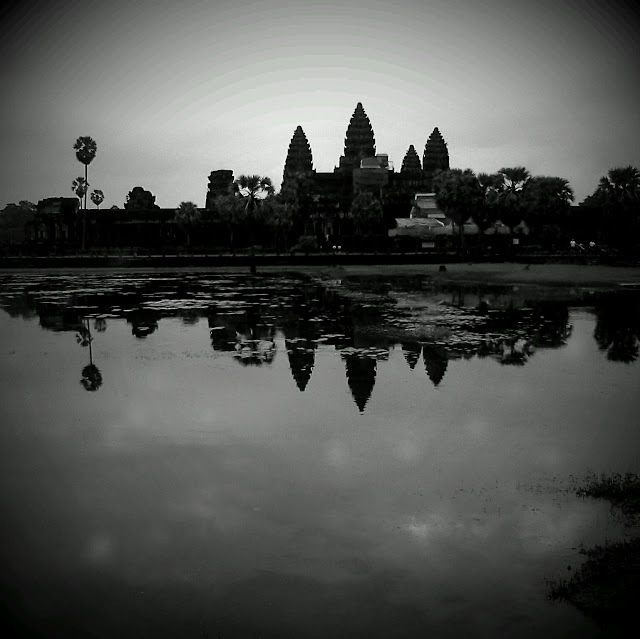 The main reason that people go to Siem Reap is to visit Angkor Wat. 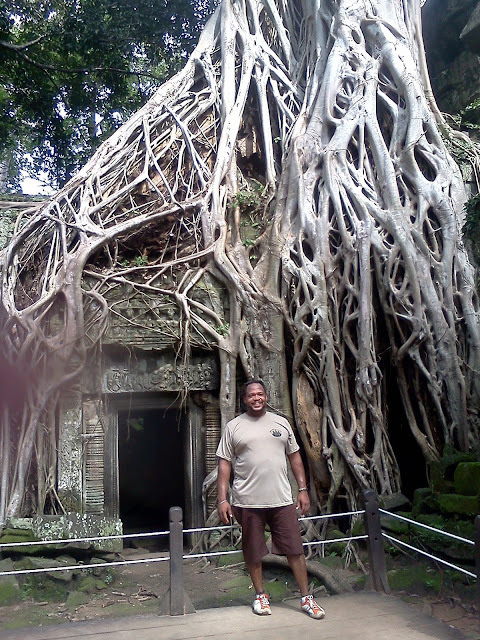 Angkor Wat is everything you ever heard it would be. Intricate carvings, massive size, historical significance, awe inspiring view, megalith dominance, and the life's work of so many ancient Khmer artisans. But what Angkor Wat is not is the most impressive temple in the site. There are dozens of temples at Angkor and each one has something unique that makes it awesome. How cool are these stone faces at Bayon? Check out how tiny my friend and month long travel mate, Lena, looks next to one of the massive trees. This is a case where the jungle has clearly proved its dominance of the construction of Man. Also, here is an obligatory shot of a tuk-tuk. In Siem Reap there are no taxis. People either ride a bicycle, walk, or hop a ride in one of these contraptions for about $1 to anywhere in town or $10 to $15 dollars for a full day of touring out and about Angkor. Here is Lady Killer. He worked for my guesthouse and was also a tuk tuk driver. 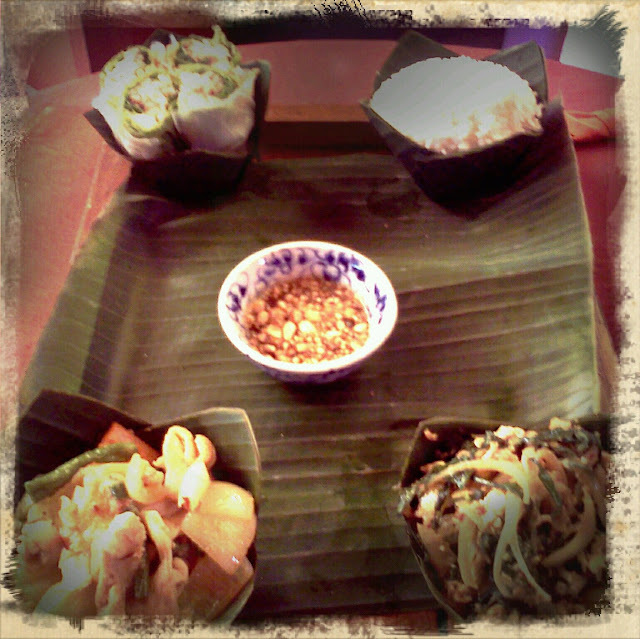 This post is getting long, so I will start a part III soon to tell you about WHY I love Siem Reap. Here's a clue: the people are great.